Dr. Alkis Constantinides, 77, passed away peacefully on November 10 surrounded by loved ones, following a long battle with myelofibrosis. He was born in Limassol, Cyprus, in 1941. During the early years of his life he lived in Nicosia, Paphos, and Larnaca, Cyprus. He graduated in 1959 as Valedictorian from the American Academy of Larnaca. Immediately after graduation, he came to the United States to study Chemical Engineering at Ohio State University in Columbus, Ohio. He spent five years at Ohio State where he obtained Bachelor’s and Master’s degrees in 1964. He excelled in all subjects at the University and he received several awards. Upon graduating from the Ohio State University, he started his career as an engineer with Esso (now Exxon) Research and Engineering Company in Florham Park, New Jersey. Two years later, Alkis decided that he wanted to obtain a Ph.D. degree in order to teach at the University level. He enrolled at Columbia University in New York in the fall of 1966, where he studied under the tutelage of Prof. Elmer Gaden, the Father of Biochemical Engineering. Following the completion of his Ph.D., Dr. Constantinides accepted a position as Assistant Professor in the Department of Chemical and Biochemical Engineering at Rutgers University in New Brunswick, New Jersey. Over the next 45 years, while teaching chemical engineering to several thousand students, Alkis advanced quickly from Assistant to Associate to Full Professor. He did research in his field, and also published many scientific papers as well as three textbooks in Numerical Methods that have been adopted at many universities worldwide. During his career at Rutgers University he held all teaching and administrative positions in the Department: he was Chair of the Department for six years, Director of Alumni Relations for twelve years, Director of the Graduate Program for nine years, and Director of the Undergraduate Program for one year. In recognition of his teaching abilities, Prof. Alkis Constantinides (known as “Dr. C.” to his students) received the “Best Teacher of the Year Award” eight times from the graduating seniors; he was also honored with the Rutgers University Warren I. Susman Teaching Excellence Award, a prestigious university-wide award for which several thousand professors were eligible to compete. Before his retirement in 2015, he established the Dr. Alkis Constantinides Endowed Scholarship Fund for the purpose of providing financial assistance to deserving students in the Department of Chemical and Biochemical Engineering. Several high performing students have already benefited from his scholarship. Throughout his life, Alkis Constantinides was an excellent tennis player and skier, and won trophies in both sports. At Ohio State University, he was the founder and President of the Ohio State Ski Club. Alkis was also an avid photographer who filled his home with pictures of his family and the many places he visited. He is survived by his wife, as well as his son and his son’s family, and his son’s mother. Denyse E. Reid died on November 14, 2018 at the Acorn Glen Assisted Living Facility in Princeton, NJ, where she has been a resident for eight years. She had been a Princeton, NJ, resident since 1954. Born to Jacques and Germaine Van Hove in Brussels, Belgium on September 28, 1922, Denyse attended school at Grasbeec School from K through 12. After one year at the Catholic St. Louis College in Brussels, she then attended three years at a school of design before and during the war, where she won first prize in clothes design. Her father was a career soldier who eventually he became colonel of the King’s regiment. Denyse’s favorite memories of the war and its aftermath were seeing the Belgian flag for the first time, after five years of German occupation, on a British Tank as it drove down the Boulevard and answering the door as her father returned from prison camp. Due to her English skills, Denyse held various positions in service to the allied forces, including as assistant to the British military Mayor of Brussels. She met her future husband John Reid when he was assigned as an air aide to the SHAEF headquarters in Brussels two months before battle of the Bulge. Jack and Denyse were married on July 24, 1946 in Manhattan. The couple lived in Charlotte, NC, and East Hampton, NY, before finally settling in Princeton in 1954. Denyse enjoyed her many travels around the world. Denyse and Jack summered in East Hampton, NY, and after Jack’s death in 1990, she spent more and more time there before moving to Acorn Glen. Denyse is survived by her sons John and Archibald, Archibald’s wife Karen, grandsons John and Thomas Reid, her sister Ann Marie, and her nieces Pascal and Ariane Hoyois. Her daughter Anne died in 1976. Grandson John was particularly attentive to her in her final years. Loved and loving, surrogate mother to may lost souls, Denyse leaves a legacy of community service and intense curiosity. Helen Joyce Curran Warren, 91, died on November 12th, 2018. She had been a resident of Princeton since 1968. Helen was born in Abington, PA, and grew up in Jenkintown, PA, the daughter of Dr. Francis Joseph and Margaret Barry Curran and sister to her twin Patricia, Joan, Jane, and brother James, all of whom predeceased her. Helen graduated with a Bachelor’s degree in English from Arcadia University (formerly Beaver College) in Jenkintown in 1948, where at different times she was the editor-in-chief of the school newspaper and the literary magazine. 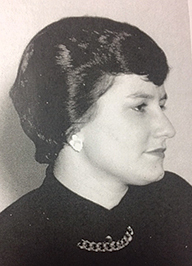 Helen was selected to appear in the 1947-48 edition of Who’s Who in American Universities and Colleges. She worked in the summer as a counselor at one of the country’s first interracial camps, founded in the Catskills by a Harlem doctor. One of her favorite campers grew up to be the playwright and screenwriter Michael Weller, with whom she reconnected in recent years. After graduation Helen worked in New York City as a magazine researcher and volunteered at Dorothy Day’s Catholic Worker Movement, an association she maintained throughout her life. During a time in Cleveland, Ohio, she was the editor for The Ohio Observer, Shell Oil’s company newspaper. Helen obtained a Master’s degree in Education from The College of New Jersey and taught Senior English for many years at Montgomery High School in Skillman, NJ, where she advised the school newspaper as part of her lifelong love of journalism. Among her other enthusiasms were Frank Sinatra’s music, Anthony Hopkins’ acting, and Jay Lamont’s radio show All About Real Estate. With her close circle of teacher friends, Helen made many overseas trips, including to her ancestral homeland of Ireland. Helen was married to John Edward Warren, who worked for the Federal Bureau of Investigation as a Supervisory Special Agent in the New York field office and predeceased her. They had three sons, Timothy and John of Princeton and Richard of Lambertville, NJ. Other beloved survivors include her daughters-in-law Maryann and Ellen; grandsons Patrick (his wife Jolene), Philip (his wife Ruth), and Davis; two great-grandsons Oliver and Ethan; her sister-in-law Cathy; and many nephews and nieces, including Jane and Kathryn Monahan and James McIlvaine who were very involved in their aunt’s care in her last year. Condolences and any inquiries can be sent to tswarr@yahoo.com. A memorial gathering will be held in Princeton some time in early January.